image	Western Michigan at #2? I’m a facts guy. I refuse to believe anything unless it’s right in front my face. And that’s why I think Western Michigan is your #2 team in college football. Think I’m crazy? 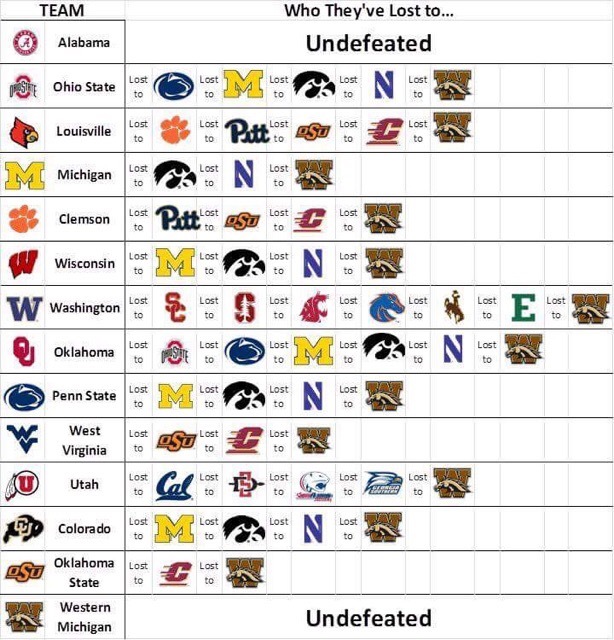 Check this picture out…..
What I see above is that not only is WMU the only undefeated team not named Alabama, but because of similar opponents they have already beat every other team in the country. Penn state beat Ohio State by 3. Michigan beat Penn State by 39. Iowa beat Michigan by 1. Northwestern beat Iowa by 7. WMU beat Northwestern by 1. Therefore, Western Michigan would beat Ohio State by 51. Case closed. Row the Boat! Next Hey Member When Gritfathers Told You Houston Would Beat Louisville?